It’s about time. We’re excited to announce the launch of the Soundslice notation and tab editor! You can now notate music — standard notation and/or tablature — directly within Soundslice. Edit existing slices in your account, or create notation/tab from scratch. The Soundslice editor is especially good for transcribing existing audio/video, because it integrates beautifully with our synced audio/video and practice tools. 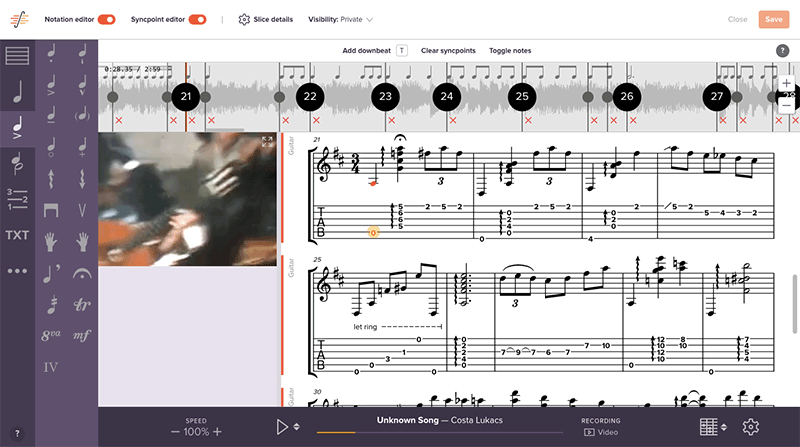 To our knowledge, this is the first time a notation and tab editor has been integrated directly with video/audio playback of source recordings and transcription tools such as slowdown and looping. For those of you who transcribe lots of music, Soundslice will save you time and make you happier. Previously, if you wanted to bring music into Soundslice, you had to notate it in a separate program: Sibelius, Finale, Guitar Pro, PowerTab, etc. It was hard enough building a notation rendering engine in the first place, so we offloaded creation and editing duties to other software. Because of this, we invested heavily into building high-quality importers. Today we have one of the best MusicXML importers in the business, and our support for other formats — Guitar Pro, PowerTab, TuxGuitar — is equally excellent. It’s been painful even for people who are comfortable using other notation programs. Say you notate something in MuseScore, load it into Soundslice, then discover you had a typo. You’d have to do the whole export-import roundtrip again. With the Soundslice notation editor, those problems are becoming a thing of the past. Every Soundslice user now has free access to the slice manager. (Previously, you had to be in our free trial for Soundslice For Teachers.) Just create an account and click “Slice manager” in the navigation. When you view one of your slices, you’ll now see an “Edit” button at the upper right of the page. (On smaller screens, this will be in the “Menu” dropdown.) Click that to enter edit mode. In edit mode, you can activate the syncpoint editor or the notation editor — or both at the same time (which is where it gets really useful for transcribing). We’ve put together documentation on all the editor functionality here. Our to-do list for editor features is long. Expect frequent improvements — and we’d love to hear from you to help us prioritize. Contact us any time, or leave a comment below. We’ll soon be making instructional videos on how to do various common tasks — notably transcribing audio and video files. But we hope it’s intuitive enough from the start that you can get productive quickly. Enjoy your new web-based notation editing powers!